October already and we are definitely into Autumn now! It’s getting darker earlier, the heating has gone on a few times and the leaves are crisp and brown. This week I have managed to be frugal in a few ways. Autumn is a great time to bag a few clothes bargains and TK Maxx is one of my favourite places to shop for designer labels at a fraction of the price. This week I picked up crazy priced Jaeger and also some statement T Shirts. Secondly I checked through the coins in my purse after seeing that a Battle of Hasting 50p is listed on eBay for 5 million! Yes I have one but after doing some research it seems they sell for about £2! But that is still a good return!! However, I am keeping mine in case it goes up in value over the coming years! Finally, I have been walking more and using the car less this has saved me money and made a big difference to my step count this week. I am enjoying the weather before it gets too dark and wet! 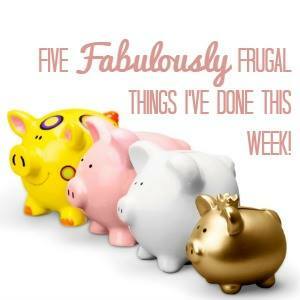 Every week we share five frugal things that we’ve done during that week just to show you that the small things you do all add up to a great frugal lifestyle where you can learn to live a fabulously frugal life. We’d love you to link up with us and show us what you’ve been doing.